The 78s from which this recording was remastered were pressed in Holland and found their way ultimately to the United States, from where collector and music lover Nicolas Hawtrey bought them and kindly presented them to Pristine Audio for restoration and release. Although there was some slight swish toward the end of two of the sides, and a marginal hint of edgy peak distortion, they have responded excellently to the Pristine Audio XR treatment, and the remastered recording is a real delight to hear. 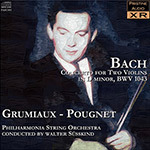 This was Grumiaux's second outing to the studios of EMI - as the review states, Pougnet was already well known. We do not believe it has been reissued since. Note the short duration of this work makes for a short CD, but a reduced-price download. We recommend the latter over the former, but are of course happy to supply this recording on disc at our usual price.